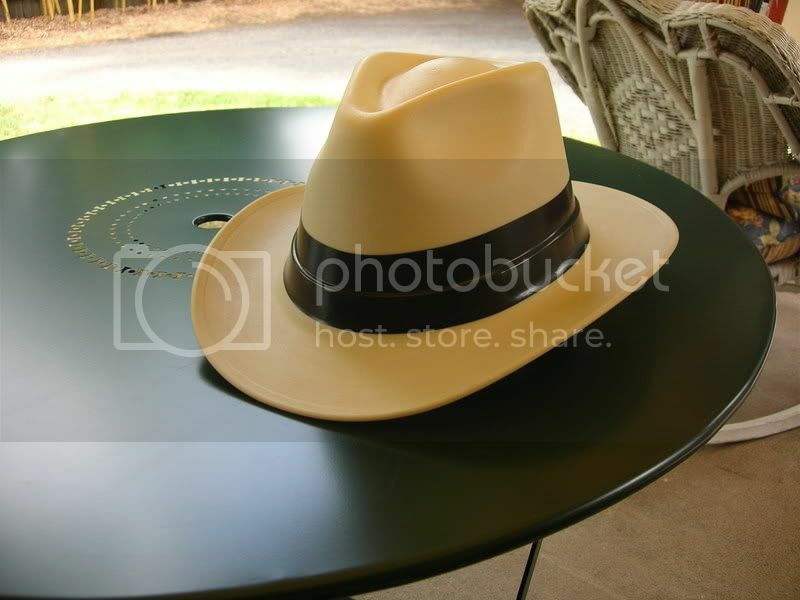 Discussion in 'Hats' started by fedoralover, Jul 29, 2007. In my job I work out of an Aerial boom truck and am required to wear a hard hat. I've always hated those duck billed hard hats and recently found one on ebay that looked like I could make it like kinda like a fedora. Here it is. I put a couple of rings of black electrical tape around it to simulate a black ribbon. At least it somewhat resembles a fedora. From 30 feet away it will project a fedora look. That's insane, you're a freakin' Genius dude. I gotta have me one of those. Fedora for sun protection: $20.00 to $60.00 on eBay. Good fedora for stylish dress: $160.00 and up at a good hat shop. Rounding out your fedora collection with one that'll protect your noggin from falling tools: Priceless. That's a great hat! Even though my job doesn't require a hard hat, I might get one. Here is one on a old Ebay ad. How'd you find it anyway? Was it by chance, or were you actually looking for it? Just down the road also. Should I or shouldnt I, that is the question. I saw a guy wearing one on a job site and decided to look on ebay and found it. The brim had a bit more curl than I wanted so I took a heat gun and warmed up the sides a little and flattened it out a touch. I actually tried painting it brown with some krylon spray paint which was supposed to be for plastic, but it was too shiny, I couldn't find any in flat brown, plus it just didn't seem to adhere very well and scratched off really easy. So I stripped it back off and just put the tape on to simulate a black ribbon. I'll wear it at work tomorrow. Here's a frontal shot, the crown has more taper than I like but I don't think I could get Art to reblock this one successfully. Painting, heating or reshaping a hardhat can affect it's integrity, and the protection it can offer. I have to wear a hardhat for some of my work here and there, and we have to replace ours periodically, because over time the plastic becomes tired, and more prone to cracking. A lot of UK hardhats come with warnings about not applying heat or paint to them, for similar reasons. Anyway, your hardhat looks great, fedlover. Good job with the tape. I'll bet that baby's got a ballistic-cloth sweatband, too?! And best of all, no moth worries and no costly repairs! ...When you incur tool or lunch pail dings -- just slap a coat of Bondo or Red Hand over those unsightly holes and cracks and you're good to go again! The one drawback to this style is that it is heavier than the other styles. 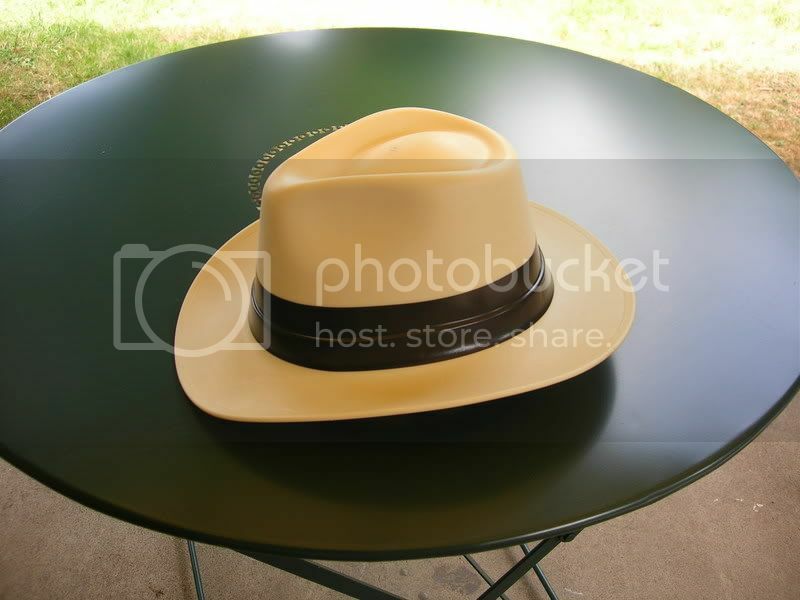 There is another cowboy style hard hat on the market that's shaped with a regular cattlemans crease and it is REALLY heavy due to all the plastic for the brim. This one is lighter than that one but it will take a while to get used to. If you do a web search for "Vulcan Cowboy Style Hard Hat" you will find a lot sources for this hat. I like the pugaree effect with the black tape.